« So much for forecasts! The streak continues! Have something to say about the weather? Leave a comment! 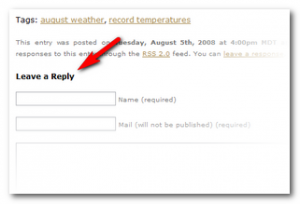 We have turned on the capability for visitors to leave comments to postings in your news / blog section. This is a great way for you to share your thoughts on the weather, comments on a topic, suggestions for us, or if you have a question about a topic, you can ask it here and we will respond. Leaving a comment / question is very simple. If you are viewing a page that lists multiple stories (like the main index), at the bottom of each story you will see a link that says “X Comments” – clicking on that will take you to that individual posting where you can leave your comment. If you are viewing an individual posting already, at the bottom of that posting is a section that says “Leave a reply” – simply fill out the form and your comment will be sent. Oftentimes these comment sections turn into nothing more than a repository for “comment spam” but we have implemented measures to help control this. In addition to some behind the scenes software that will control this, we also will have the system set so that we must manually approve a comment before it appears. Don’t worry – there won’t be any censoring of comments – we are going to do this temporarily until we are sure we aren’t going to get spammed with comments. Now you can leave comments & questions to us! We are excited to be able to implement this new feature to help us share our passion for everything weather! So, do you have anything to say? Let us know! This entry was posted on Wednesday, August 6th, 2008 at 6:19am MDT and is filed under Site News. You can follow any responses to this entry through the RSS 2.0 feed. Both comments and pings are currently closed. Great new feature! Love your website. Now if you could just bring some moisture and cool things down I would be happy!